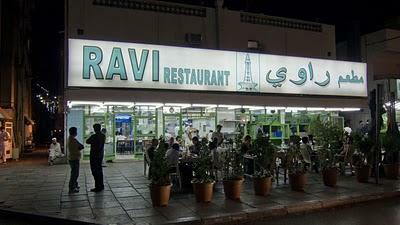 Untie your belt if you have a plan to visit Ravi Restaurant in Satwa district of Dubai. Because this traditional Pakistani eatery is well-known for serving the most luscious and lip smacking dishes of the region at extremely affordable prices. Their menu includes grilled meat, succulent curries, perky daal, tender bbq, sumptuous biryani, fresh naans, rotis from hot oven, and much more. These delicious dishes can be consumed in Ravi Restaurant’s dining or family room, but its worth sitting in the outdoor seating during pleasant weather in order to enjoy the hustle and bustle of Satwa. Lot of cabbies also come to this restaurant because here they can eat like a king and pay like an almsman. - Outdoor seating facility and takeaway service is available at this restaurant. - Traditional Pakistani cuisine is served which attracts a large number of tourists from Pakistan. - Some of the mouth-watering dishes include roast, karhai, korma, biryani, chicken malai and mix sabzi. - To view the menu of Ravi Restaurant, click here! Operations begin at 5:00 am early morning in Ravi Restaurant and last till 3:00 am daily, as this venue opens on all days of the week. Al Dhiyafa Road, Satwa – Dubai - United Arab Emirates. 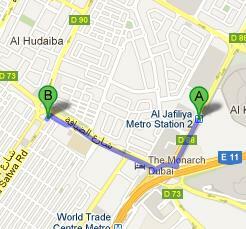 Al Jafiliya Metro Station 1 is 1.8 kilometres far from the Ravi Restaurant in Satwa. This makes it a walking journey of about 22 minutes. All commuters need to do is to head in the southwest direction on شارع الشيخ خليفة بن زايد‎/D 88 and at the roundabout, take the second exit in order to continue straight onto شارع الضيافة‎/D 73. After that commuters should make a slight left turn towards Al Dhiyafa Road and then continue straight onto Al Dhiyafa Road, where destination is situated on the left side. Satwa, Post Office – Dubai bus stop is just 2 minutes walk and 150 meters away from the Ravi Restaurant. So, patrons of this restaurant should take any of these bus numbers 7, 32C, 55, 88, 93, 98E, C1, C9, C14, C26, F11 and x13 to arrive at this bus stop. Then head northeast on شارع السطوة‎/D 90 towards 9th Street from this bus stop and then continue onto Al Dhiyafa Road to locate the destination on the right side. View map for directions.